My understanding is the Nocona 3.6 is the same care os the P4 3.6F. Cache size and all. There is no L3 cache on this chip as far as I know of yet. Hmm... #68, that's nice.. 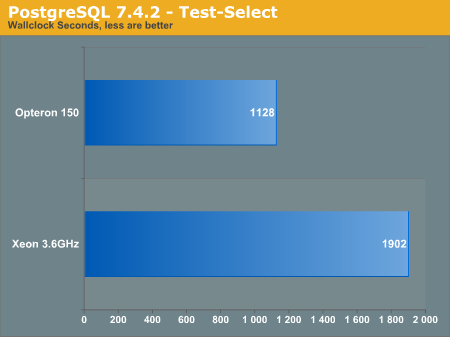 I would also like Apache server performance as well, as this one is server CPU shootout. Try to reconstruct a page request response benchmark. kind like the one that used in Opteron review or in AcesHardware. 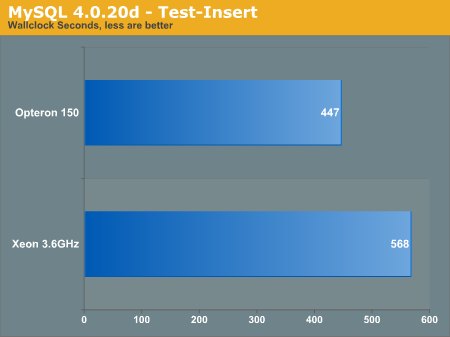 Also, please check the scalability when adding second and 3rd/4th processor. how many percent can we gain over the single one. BTW, Kris.. in my opinion, Nocona 3.6 is not comparable to P4 3.6F, because Nocona 3.6 is way faster than 3.6F. It is much more comparable to P4 3.6EE than 3.6F vanilla. I think Intel will release a new 3.6F with vanilla P4 flavor when it is re-released as plain a plain one. So, I guess, 3.6EE is not comparable to A64 3500+ in many ways, as P3 3.4EE is comparable to AFX-53. Good review. This one was definitely thoroughly explained and well-thought-out. One last comment as well, and then I'll shut up. I also posted after reading the first article, so I figure I may as well do so again. I'm still a little confused why KK still thinks that a 3.6GHz P4 will be marketed against a 3500+ A64. They do not occupy the same space, price-wise. If you're looking at a 3500 in the name, even Intel realizes that you can't judge by numbers alone, based on the fact that they are moving to an arbitrary naming convention for their processors. The only way to compare the two different product lines is by price, because that is the only constant. So, if the 3.6GHz P4 is the highest priced desktop cpu, then you would have to compare that to AMD's highest price. For example, if you have 2 systems in the store side-by-side, and one was priced $500 more than the other, wouldn't you assume that the higher priced item would be that much better, hence the higher price tag? Especially nowadays when $1000 can get you a very capable system, $500 is a huge price difference. Basically, all I'm saying is that it is faulty reasoning to assume that a 3.6GHz Intel cpu will be marketed against a 3500+ Amd A64 cpu. Heck, even AMD doesn't know how to market their own Semprons... apparently, a Sempron 2800+ is only equal to an AXP 2400+ in terms of performance... very weird and wacky stuff! As far as the chips used...These are very much in compitition with one another. Around the same price and "the best workstation processor" of the respective competing companies. Best vs. best and price. What else is there? T8000, it is interesting how you consider this second review biased, even though many people had pointed out legitimate problems with the first one. You bring up a good point about HT though. Even though it helps in some cases, it hurts in many others. How much of a selling point is it in that case? I was impressed with both the constructive criticism of the readers and the profesionalism of Kris's responses in this whole affair. Very nice job on this follow-up review. Hopefully, more updates will follow as more 64-bit programs become available.